Winners from the 2017 International Photographic Competition Revealed During Imaging USA 2018 in Nashville, Tennessee. The Grand Imaging Award winners have been judged to be the very best of the 2017 International Photographic Competition. 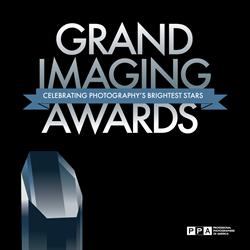 Professional Photographers of America (PPA) presented the Grand Imaging Award this week at Imaging USA 2018, the largest annual conference and trade show for real professional photographers. The award went to Ben Shirk, M.Photog.M.Artist.Cr. for his image “Till Death Do Us Part" in the portrait category. Shirk, a leader in athletic portraiture and 13-time winner of Grand Imaging Awards, was selected as the overall Grand Imaging Award winner out of a pool of ten category winners. The other winners were Ted Linczak, M.Photog.Cr. in the non-event album category, Marceliano Muñoz, M.Photog.Cr. in the event album category, Sandra Pearce, M.Photog.MEI.Cr., CPP in the artist category, Gail Nogle, M.Photog.Cr.,F-ASP in the illustrative category, Michelle Garcia in the animal category, Cristie Reddehase, M.Photo.M.Artist.Cr. in the children category, Douglas Bennett, M.Photog.Cr in the landscape category, Cyndi Hornsby in the senior category, and Erich Caparas in the wedding category. Each category winner received a crystal award. Shirk received an award and an additional $1000 prize. The Grand Imaging Award winners have been judged to be the very best of the 2017 PPA International Photographic Competition (IPC). The Grand Imaging Awards encourage photographers to up their creativity by pushing themselves through competition with each other, their peers. The Grand Imaging Award winner was selected from 5,800 entries. Shirk’s image was judged by a panel of 33 jurors to be the very best of images in this year's loan collection. He was also chosen to represent the United States as part of Team USA in the World Photographic Cup, the "Olympics of photography", wherein 30 countries compete via images this May in Queensland, Australia. In addition to the Grand Imaging Award, PPA awarded medalists from the IPC. Bronze medalists had all four of their submitted images earn merits. Silver medalists had one of their images entered into the Loan collection and on up to a four-for-four, "perfect" case for Diamond medalists. At this year's ceremony, PPA awarded 152 bronze, 108 silver, 70 gold, 29 platinum and 29 diamond medalists. The International Photographic Competition is held each August. District competitions run January through April. All PPA photographic competitions are open to the public. For more information, visit PPA.com/Competitions. Professional Photographers of America (PPA) is the largest international non-profit association created by professional photographers, for professional photographers. Almost as long-lived as photography itself, PPA's roots date back to 1868. It assists 30,000 photographers through protection, education and resources for their continued success. See how PPA helps photographers be more at PPA.com.